Does The TEST Button Really Test? Residential Smoke Alarms: Does The TEST Button Really Test? The media, consumer knowledge, safety professionals and legislators have all heightened our awareness of the importance of smoke alarms, but do they work as they’re touted and does the Test button really test? According to estimates by the National Fire Protection Association (NFPA) and he U. S. Fire Administration (USFA), U. S. home usage of smoke alarms rose from less than 10% in 1975 to at least 95% in 2000, while the number of home fire deaths was cut nearly in half. This data suggests that smoke alarms have a dramatic impact on saving lives, but we should be doing even better than this. Statistics reveal that most fire deaths still occur while sleeping and that 75% of these sleeping deaths are caused by toxic smoke, not heat or flame. The Federal Emergency Management Agency finds that more than 60 percent of all residential fires reported do not have a working smoke detector. Obviously the presence of smoke alarms is the first step in saving lives and property, but their effectiveness is highly dependent on the choice of technology, the location/position, proper maintenance, periodic testing and the ability to be heard and seen. The most common types of smoke alarms used in residential occupancies are based on the detection principle (technology); they are the Ionization and Photoelectric or a combination of these detection methods. Let’s compare some of the advantages and disadvantages. Fast flaming fires typically occur when highly combustible materials such as finely divided matter (e.g. sawdust) or flammable liquids (such as grease, oil or gasoline) are ignited. Shortly after ignition the temperatures in the environment can rise to dangerous levels very rapidly. Smoldering fires are typically caused by cigarette smoking in bed or a lit cigarette becoming lodged in furniture. These conditions tend to produce relatively large particles of smoke long before they produce an open flame or large amounts of heat. During the smoldering period, the environmental temperature tends to rise relatively slowly until the nearby combustible material (typically bedding or furniture) begins to burn rapidly. Most nuisance or false alarms are caused by the improper location or improper choice of technology. If your alarm sounds when you’re smoking, Great! STOP SMOKING, DON’T REMOVE OR DISABLE THE SMOKE ALARM! Alternatively, steam from cooking, or a blast of water vapor from a bathroom shower may cause a smoke alarm to accidentally activate; therefore, it is probably either located too close to the bathroom/kitchen or is probably of the ionization type. Don’t mount the smoke alarm directly in a bathroom and don’t mount the alarm directly near the cooking area. It is better to use a photoelectric or combination type near kitchen and bathroom areas. OK, so once per year you press the TEST button and you feel secure because the smoke alarm is working, right? Wrong! Did you know that the built-in Test button on smoke alarms is not a 100% functional test! The TEST button will test the power source and the sounding and/or flashing warning system, but it only partially tests the electronic circuitry. The TEST BUTTON does not test the ability or sensitivity of the smoke alarm to actually detect smoke. For example, if you place a well-sealed plastic bag around the smoke alarm and press the TEST button, the smoke alarm may seem to test good, but it won’t respond to external smoke, because the plastic bag blocks the air flow to the detector. Therefore an actual test with smoke (full functional test) should be also periodically performed. A smoke test can actually be done without the obnoxious odor of a cigar or cigarette and without actually burning something. There are aerosol (canned) smoke spray products on the market. These are odorless, relatively inexpensive ($5 to $13), environmentally safe and specifically designed for this purpose. Unfortunately many home inspectors don’t perform this type of test during a typical home inspection in conjunction with a property sale, unless specifically requested to do so. Even if it costs a little extra, the resulting safety benefit is well worth any slight additional cost incurred. Even though the smoke alarm may successfully detect smoke, since most fire deaths occur during sleeping, it is imperative that the smoke alarm be heard, or more importantly seen in the case of the deaf or hard-of-hearing. Many system (interconnected) smoke alarms have signaling wires which allow the responding smoke alarm to activate the sounder (beeper) or lights at the other interconnected smoke alarms. 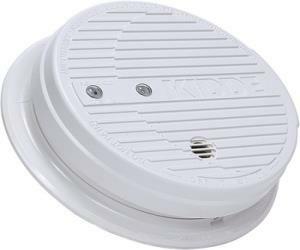 This system has an advantage over the stand-alone non-interconnected battery-operated smoke alarms, because the beeping or flashing will occur at all units. This provides earlier and more widespread warning, which is especially important for the occupants of rooms that tend to be isolated or considerable distances from the source of smoke. Carbon monoxide (CO) is a normal byproduct of combustion. Dangerous CO levels can be produced either by a fire or a malfunctioning/improperly maintained gas-fired appliance. The appliance may produce toxic and lethal CO without significant smoke. Therefore the U.S. Consumer Product Safety Commission (CPSC) recommends that every home also have CO detector/alarm. Since CO can put people into a deeper sleep or state of unconsciousness, it is important to have the necessary early warning of a smoke or CO to ensure that they wake up. If you are deaf or hard-of-hearing, install a smoke alarm that also incorporates a flashing strobe light or visual alerting device. Install smoke alarms at all levels of a multi-level premises and especially within all bedrooms, if occupants sleep with the doors closed. Avoid nuisance alarms by following the selection and installation guidelines by the manufacturer and below. Nuisance alarms cause people to distrust, ignore, disable or remove smoke alarms. THIS IS VERY DANGEROUS. Select the proper type (ionization, photoelectric or combination) of smoke alarm for a given location. The photoelectric type is a good choice in bedrooms where fires are often caused by smoking materials and near areas subject to steam or water vapor. An interconnected system of smoke alarms will provide more widespread coverage in alerting the occupant(s) of smoke and impending fire and a certain amount of redundancy increases the chances of early warning if one or more of the other units malfunction. Install alarms on the ceiling or on a vertical wall 4 to 12 inches below the ceiling, but avoid placement in a dead air space (e.g. corners of rooms or the apex of a peaked ceiling) or where drafts due to HVAC vents or fans will prevent the flow of smoke to the alarm. Make sure the smoke alarms are powered and have good batteries. When you hear a periodic "chirping" sound, replace the battery [ies]. AC or DC (usually used in conjunction with a security system) powered smoke alarms with a battery backup will usually extend the battery life and provide a primary energy source along with a secondary energy source (backup) if one fails. Avoid rechargeable batteries; they can exhibit rapid voltage drops (without a "chirping" alert) near the end-of-charge region. Lithium batteries, which may last up to 10 years, are a good choice in locations with difficult access like high (vaulted) ceilings. Protect smoke alarms from contaminants such as spray paint, construction dust, drywall and wood cutting operations. Contaminants may reduce the smoke alarm’s sensitivity to detect smoke. Periodically clean the insect screen of the smoke alarm so that the detector is not masked and its sensitivity is retained. Monthly test the smoke alarm’s batteries with the Test button and also semi-annually or annually or test the smoke alarm with an aerosol smoke spray (this is a full functional test). Defective or outdated ionization type smoke alarms containing radioactive Americium 241 should be returned to the manufacturer or a local retailer, such as Radio Shack or Sears for proper disposal. Don’t throw it in the garbage!